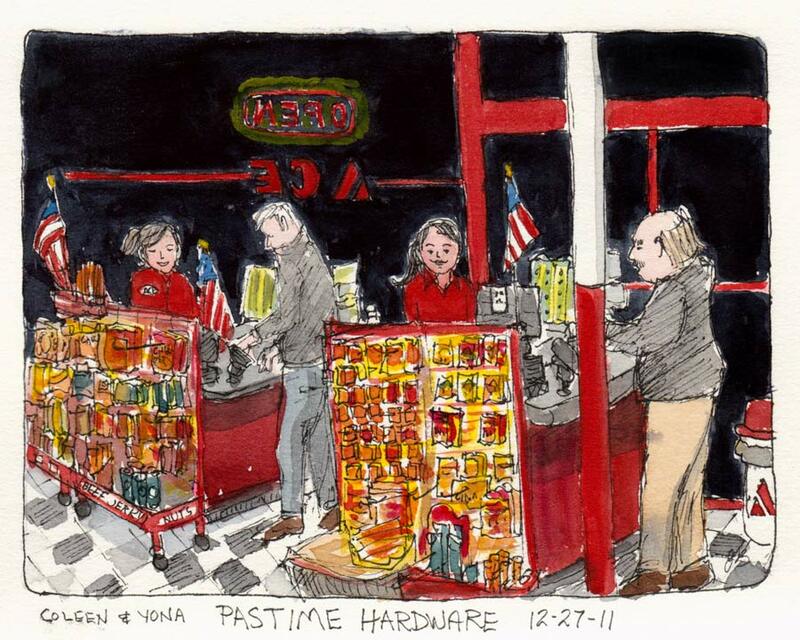 Pastime Hardware After Dark, ink & watercolor, 5x7"
Before I get to my reflections on art and life in 2011, a word or two about the sketch above (and below) from our evening at the hardware store. I stood and sketched between the paint solvent and cleaning product aisles (both stinky), using an aisle-end shelf for my paints. When we finished and shared our work, I realized that in the original sketch above, I ignored the fact that it was dark outside. So when I got home I painted all the windows dark. I’m not sure which I like better. What do you think? Converted a 440 square foot garage into my new studio including a patio door onto a deck off the studio, insulation, sheet rock, flooring, electrical, and water. Once I have everything moved in I’ll post the story with pictures. So honored to have several sketches included in The Art of Urban Sketching: Drawing On Location Around The World (coming in February). Idaho Landscapes, the magazine of the Idaho State Historical Society published my painting Quinceanera Boy. After a brief (and briefly successful) venture into painting things to sell, returned to following my whims and inspiration instead of worrying about making work that would sell. This led to the series of 16×20 portraits of people at work in my community, now well underway. Learned from Rose Frantzen video (see clip here) to say “Oops, made a mistake…but that’s ok I can fix it!” instead of “Now I ruined it!” followed by self-critical name calling. It’s downright liberating! Realized that while I value and enjoy many different artists’ styles and techniques, I’ll never be as good as them at painting like them so I’m focusing on painting like me instead, which I can get good at. Learned to ask myself, “What do I want to do with art today,” and doing that, not what some imaginary critic or the illusion of an audience is demanding that I should be doing. I heard Robert Genn say that one’s style is often the thing one doesn’t do right, that it’s your mistakes or the rules you break that make it yours. I’m learning to relish and appreciate my wonkiness. Perfect is boring. When someone plays piano and finishes a tune, there’s nothing left, just quiet. Why not paint that way too, focused on the line, the brush stroke…enjoy the process and let go of the product. Abandoned water-soluble oils and acrylics for regular oils after learning from my friend Kathryn Law how to reduce the use of toxic chemicals and still get the consistency I like. Started watercolor sketching instead of oil painting at plein air paintouts to quickly capture a scene and keep moving instead of standing in one spot for hours while the light changes completely. Tried a bunch of different pens, from expensive Namiki Falcon fountain pen that I didn’t love (sold it) and inexpensive uni-ball Vision Roller Ball , but returned to my favorite, Lamy Safari Extra Fine Point Fountain Pen with Carbon Platinum ink. Both hold up well on the watercolor paper I use in my journals. Registered for a week-long Alla Prima Portraiture class with Rose Frantzen at Scottsdale Artists School in February 2012. (So excited!!!) It is way out of my comfort zone (and budget) but I adore her work and her book, Portrait of Maquoketa and she is a fabulous teacher. Took a 3-day workshop with Peggi Kroll-Roberts in her studio after studying her series of CDs. Learned how to mix/use juicy luscious paint and more. She said I needed to work on my drawing. Studying the Loomis books Drawing the Head and Hands and Figure Drawing for All It’s Worth to improve my people-drawing skills. Unlike a painting of a pear which can succeed even if the drawing is a bit off, a portrait will fail. It may still be an interesting painting, just not of the person you’re painting. Continued to sketch nearly every Tuesday night with my Urban Sketchers group and regularly sketch my world. As a group we have committed to a sketch a day in January. Finally mastered binding journals using the method in my directions and can create a journal in a few hours instead of days. To mix things up I switched to a Moleskine when I finished the last journal and am already missing my handmade sketchbooks with their really nice multimedia paper. Made the decision to wait until I leave my day job in a year to put effort into art biz/marketing and just concentrate on painting until then. Sold a number of paintings early in the year on DailyPaintWorks. Recently sold a sketch of Der Wienerschnitzel for their corporate collection. Found balance by prioritizing making art and living life above blogging about it. Celebrated my six-year blogging anniversary with 180,000 views in 2011 (982,746 total); 141 new posts (total 1,004) and 418 pictures uploaded in 2011. 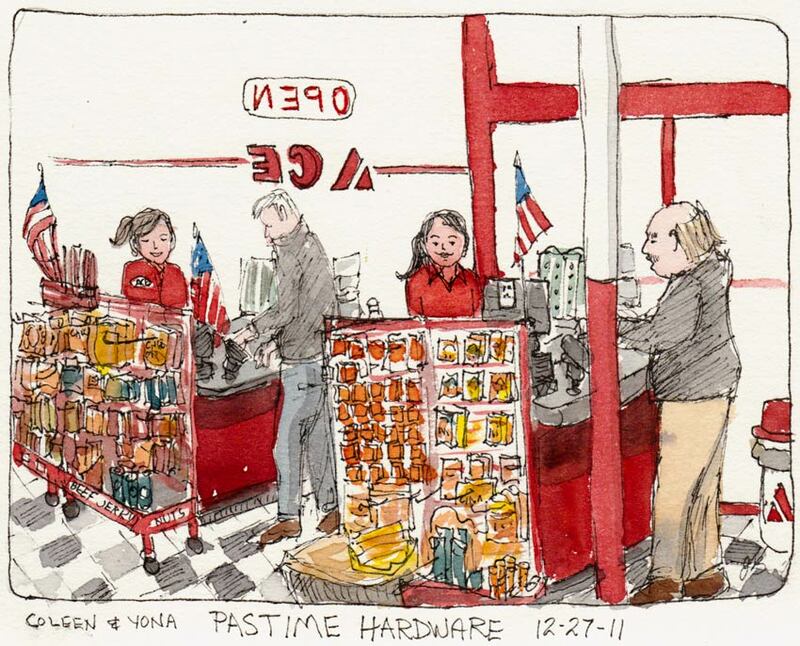 Posted regularly and administered the Urban Sketchers S.F. Bay Area blog. Regularly follow about 30-50 other art blogs. I like your work. I think with the hardware store, I like the light background more than the night time but either way it’s really good. I like the detail. Great work. Great post Jana – and you seem to have your life in balance. Balance: Definitely a work in progress! both the dark and light, but the dark brings more attention to the fact that you don’t see anything outside the window. But that’s not the focus anyway, more of a subliminal thing. Wow! You accomplished so much this past year! I especially like the idea of the “urban” sketchers. Great places to paint! A year of reflection and progress. Great post, Jana. Always an inspirational post! You got so much done in 2011—you’re all set now to really roll in 2012. And how do you use oil paints while minimizing the use of toxic chemicals?! Hi Carol, What I learned from Kathryn is to use just a small palette cup (holds a couple tablespoons) of odorless mineral spirits while painting (I keep it covered with a small jar lid) and just use a little of it to moisten the paint or brush as needed (and a little walnut oil if I’m painting in layers and need medium) rather than a big open jar of OMS for washing brushes while painting. I wipe off a brush and reuse it for similar colors/temperatures/values until it’s too dirty and then I put it aside and pick up a clean brush. That way I’m using very little solvent while painting. Later I clean all the brushes later at the sink with a window open by wiping with paper towel, dipping in the OMS and then wiping again, using the remaining solvent in the little cup and adding more if I need it. Then I wash them all with Masterson’s brush cleaning soap and water. If there’s any OMS left in the cup I put it in a jar to settle and reuse, but usually I finish it off, wipe the little cup clean and wash it. The paper towels go into a lidded trash can and when I’m done, out to the trash. I’ve tried using only walnut oil instead of OMS for both moistening the brush and cleaning them, as that is a completely solvent-free way to do it but it’s a little more work, and not really appropriate for painting in oils in layers since you don’t want to be adding oil in the first layers. It’s fine for alla prima painting though. Wow, you’ve been super busy! Hope that 2012 brings you many new art adventures! Happy New Year. Loving the whimsical nature of your work and are very jealous of San Fran as your inspiration. Your blog prompted me to start my own as a bit of fun. Looking forward to all the gems in 2012. P.s. I like the black background better – it feels like it would at night. Wonderful post, Jana, and there is so much to think about that I will have to read all of this several times. I like the blackened windows. Gives that cozy store atmosphere when it’s dark out– a very different feeling than I get from day-lit windows. Wow what a year you had with some important realisations and some great decisions. Lovely, inspiring post (which I think I may well imitate sometime soon!) – just keep creating!